To the island of Burano by vaporetto 2019 (water buses, ferries). All lines, timetables and tickets to Burano. A vaporetto or water bus is a public ferry in Venice. The boats are the only means of public transport in Venice and to the islands in the area. 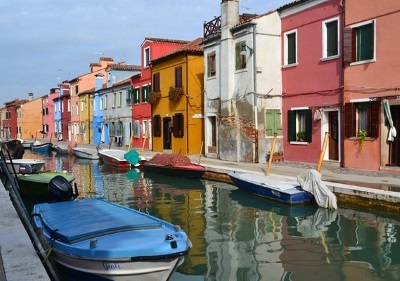 Cars, buses and even bicycles are forbidden in Venice and many islands like Burano. Burano is the second most popular island for a day trip after Murano. From the oldtown of Venice, several bigger waterbuses run per hour to Burano. The Vaporetti (plural of Vaporetto) are, like much in Venice, not exactly inexpensive. This is probably the most expensive public transport within a city in the world. You should consider, however, that the operation of ferries is considerably more expensive than buses or trains. There's only time tickets in Venice. This means that the tickets for the vaporetti (water buses) are valid for a certain time, no matter where you go. Single tickets are available for 7.50 euros (as of early 2019). You can change, the ticket is valid for 75 minutes. So a trip trip to Burano costs 15 Euro. Note: These tickets are not valid for ferries to and from the airport. In principle there is only one important vaporetto line to Burano, line 12. The other two waterbus lines to Burano are rather unimportant for tourists. There are boat connections from the small neighbouring island Torcello in the early morning to Burano and a night line. In Venice, the ferries of line 12 depart from the north of the old town (Fondamente Nove, at least every 30 minutes during the day, mostly more often). This means that the vaporetti to Burano do not stop at the main station or bus station. You have to change at Fondamente Nove or on the island Murano. Also from San Marco (Piazza San Marco) there are no direct water buses to Burano. On the island of Murano, the water buses of line 12 stop only at one stop, the "Faro" stop.". On Burano the ferries stop at the island's only waterbus jetty. The island of Burano is not very big. You can walk almost everywhere in 15 minutes. After Burano some of the passenger ferries (during the day at least one per hour) go on to Punta Sabbini on the mainland. From there you can easily get to the tourist town of Jesolo (about two bus connections per hour during the day). Other smaller stops: On the way many vaporetti of line 12 stop on the smaller islands Mazzorbo and Torcello. Shortly before Punta Sabbioni the ships stop again on the mainland, at a jetty called Treporti. Buses to Jesolo and so on are mainly from Punta Sabbioni. Short video: What is a water bus (vaporetto) ? Island Burano to Punta Sabbioni (mainland): 30 to 35 minutes. How do I get from Venice Central Station to Burano? From the main station Santa Lucia you can get to the island Burano only by changing ships. The best is to ask at the jetty of the vaporetti ferries for the next boat to Fondamente Nove. There you change to line 12 to Burano. Those who want can also change on the island Murano, you can to that at the pier Faro (lighthouse). You also have to change from Piazzale Roma (bus station, tram, car park, etc.). Also here, you simply ask the staff of the water buses at an information desk to Vaporetto for Fondamente Nove. Piazzale Roma is only 200 metres from Santa Lucia main station anyway (you can cross a large modern pedestrian bridge). Almost all vaporetti stop at Piazzale Roma as well as at the railway station (name of the jetty at Ferrovia). How do I get from the island of Lido to Burano? Also at the jetty on the island of Lido, it is best to ask for a water bus for "Fondamente Nove" and change ferries. Alternatively you can take line 14 to Punta Sabbioni and change to line 12 to Burano. But this can lead to a somewhat longer waiting time, as the ferries from Punto Sabbioni to the island Burano don't run that often. San Marco with St. Mark's Square is in the south of Venice, Fondamente Nove in the north. Thus, you habe to go around half of the island Venice (there are a lot of water buses) and then change at the jetty Fondamente Nove to the island Burano. 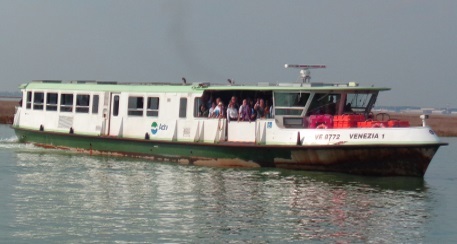 The ferries of the Vaporetto line 12 to Burano are relatively large, there is room for several hundred passengers. Nevertheless, the water buses are often overcrowded. This is especially true during the high season. Before 9 a.m. and in the afternoon there is usually less traffic towards Burano. There are toilets on the vaporetti of the line 12, but they were often locked during our trips. The ferries do not transport vehicles. If you want, you can visit more than one island in one day. If you are in Burano, you should definitely visit the island Mazzorbo. The two islands are connected by a pedestrian bridge. You do not have to go back again. Most of the water buses of the line 12 also stop at the jetty in Mazzorbo. This ferry stop is seen from Burano on the backside of the island Mazzorbo. All vaporetti to Burano also stop on the island of Murano. You can visit the large island of Murano on the way there or on the way back as part of a day trip to Burano. Also a trip to the quiet island Torcello with a very famous church is great.